ysabetwordsmith | Character Notes for "Everything That Is Real About Us"
Character Notes for "Everything That Is Real About Us"
These are the characters appearing in "Everything That Is Real About Us." Logan Bainbridge -- He has fair skin, brown eyes, and short dark hair. He lives in the Santa Cruz neighborhood of Westbord. There he runs the shop Hatters Gonna Hat above IT Beach. Quirky and confident, he thrives outdoors in a crowd of lively people. When he gets stuck indoors for more than a day or two, though, he quickly develops cabin fever. As a result, Logan spends most of his time outdoors, no matter how bad the weather. He just rotates the stock of hats available. In nice weather, he sells a lot of sun hats; in nasty weather, he switches to rain hats and stocking caps. His t-shirt has an oval of vrip cloth on the front. You can stick any color of face on there, and then stick additional features on top. In this case he has applied a blue face, a gray features frame, black nose and mouth, with googly eyes. The St. Elmo Sankofa Home is a group home that provides long-term placement for foster children who cannot be adopted or are unlikely to be adopted. Most of them have special needs, and this is one of the few group homes that accepts superkids. It currently holds four adults (one older, one middle-aged, two younger), two older teens, six children, and one infant. The black boy has learning disabilities, and his superpower is slowing things down. He was actually given up due to the disabilities before anyone recognized his superpowers. The Asian teen girl has Super-Speed but little control; her foster brother helps her to stay at ordinary speed. She still has regular contact with her parents, who could not help her master her ability, so they agreed to a group home for the sake of improving her quality of life. The Asian boy at the far left (10), the Japanese-Chuk'chansi boy at the far right (12), and the seated boy (8) are all Super-Intellects. The one on the left was rescued from North Korea. The one on the right is Ichiro Airey, who was abandoned by his Japanese-American mother, and the Chuk'chansi tribe refused to acknowledge him at all. The seated one was taken away from exploitative parents who were trying to make money from him on the chess circuit. Collie, the blond boy riding piggyback, is a shapeshifter who was taken away from his parents due to therapeutic and other abuse. The infant was summarily dumped at a safe haven because her parents thought she was flickering, although no sign of superpowers has manifested since. The mixed-race girl was orphaned just over a year ago in a house fire, and very articulately explained that she did not want to consider adoption immediately because she did not want a rebound relationship. The boy sitting on the tandem bicycle is a survivor of severe abuse that has left him with behavioral issues. He was taken away from his parents by Family Services. Ellen Capercaille -- She has fair skin, brown eyes, and chestnut hair with just a little wave that falls past her shoulders. She wears glasses. She grew up in Winlock House and is a house sister of Elisabeth Finn. Her heritage includes British, French, and German. Ellen speaks Awaswas Ohlone, English, Esperanto, Chinese, Chuk'chansi Yokut, Farsi (Persian), German, Japanese, and Spanish. In college, Ellen studied child development, special education, and trauma-informed care. She earned an Associate of the Arts degree in Child Development with a Certificate of Achievement in Early Childhood Mental Health and a Certificate of Achievement-Advanced in Early Intervention/Special Education Assistant from De Anza College in Cupertino, California (near Santa Cruz). She earned a Bachelor of Arts degree in Community Studies with a Special Education minor from the University of California in Santa Cruz. She also took a summer intensive program for a Certificate in Advanced Trauma-Informed Care from the California Center of Excellence for Trauma-Informed Care in Santa Cruz. Currently, Ellen serves as a house mother in the St. Elmo Sankofa Home in Santa Cruz, California. She and her coparents take care of children with special needs. This is one of the few group homes open to superkids, so they have a lot. As a hobby, Ellen makes artificial bird nest sculptures ranging from tiny desktop ones to giant ones that can be used as a couch. When one of her house children moves out, she gives them a nest of whatever size and style they prefer. She leaves some kind of personal trace on pretty much everyone she meets, and for that matter, is easily tracked through an environment. Most of these are 1-2 day training sessions. A few are partial-day or 3-day ones. In T-America, the CCETIC offers a summer intensive during which sessions of all their trainings are offered. Students can earn a Certificate of Completion for each individual class, or a Certificate in Trauma-Informed Care for 10 classes plus a weekend practicum and final exam. They can earn a Certificate in Advanced Trauma-Informed Care for 20 classes plus a practicum of 1-4 weeks and a final exam. CCETIC has an arrangement with the University of California in Santa Cruz to credit a minor in Trauma-Informed Care for students who complete all 40 classes plus a set of courses on the UCSC campus. Making bird nests is a fun hobby. You can use vines, grass, twine, or other materials. 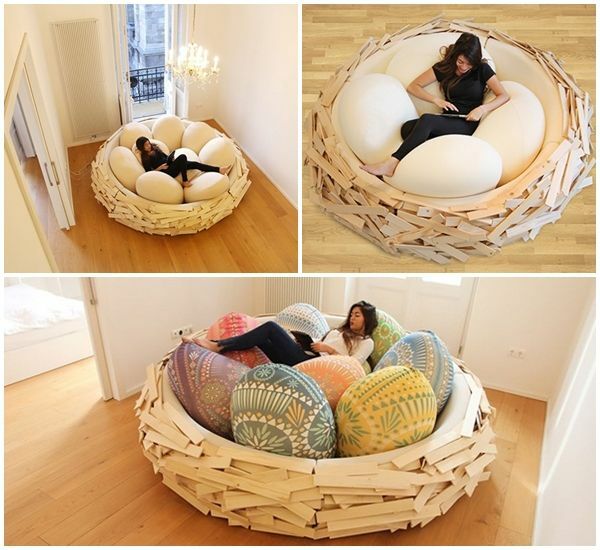 See examples of Ellen's bird nest couch and yard chair. 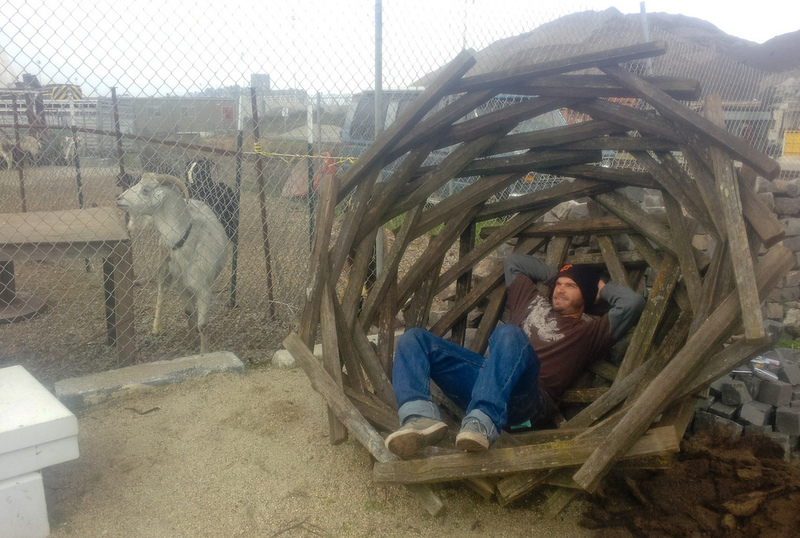 The young man in the nest was one of Ellen's house sons, who now runs a small but popular Community Supported Agriculture farm of dairy and meat goats. Collie Longenecker -- He has fair skin, dark blue eyes, and pale golden-blond hair. He is currently 4 years old. In human form, he tends to look deformed. His natural, relaxed form is a fleshy blob. He was taken away from his birthparents because they hired a therapist to train him to hold human form, which amounted to abusing him whenever he got it wrong or started to slip, which was most of the time. That soon wrecked his mental and physical health. So Family Services took Collie away and placed him in the St. Elmo Sankofa house, one of the few group homes that accepts superkids. His houseparents are working hard to convince him that it's okay for him to be a blob most of the time. Collie is still clingy and self-conscious due to the abuse, though. He loves his new family and is settling in pretty well. Origin: He was born with his superpower, and it was obvious because he was a soft squalling blob. He learned human form about the time most babies start to crawl, but at that point he could only hold it for a few seconds and it was not at all convincing. He has to concentrate in order to hold human form. He isn't very good at it yet, and he can't do it for very long. Ichiro Airey -- He has golden skin, black eyes, and straight black hair cut short. He wears glasses. He is currently 12 years old. His father is Chuk'chansi Yokut and his mother is Japanese-Ameircan. Ichiro lives in the St. Elmo Sankofa Home, because his mother abandoned him, and his father's tribe refused to acknowledge him at all due to a combination of Tex Airey's misbehavior and politicking that has led to mass disenrollments. Ichiro speaks English and Chuk'chansi, but he didn't get the latter from his father; he is learning it from his housemother Ellen Capercaille. Her fluency with his heritage language is one reason for placing him in this home (which is some distance from his hometown). Even though the tribal rejection set him outside the laws of placement for Native American children, California Family Services did their best to find him a home that would support his culture. The placement has been a great success, but Ichiro's family background is still a sore spot for him. He also enjoys shodo, or Japanese calligraphy, although he does not know that language. He would like to learn someday, but is concentrating on Chuk'chansi first. Origin: His superpowers grew in slowly.Uniform: Casual boy clothes. Tex Airey -- He has fair skin, brown eyes, and long black hair with just a little wave. He keeps trying to grow a mustache and beard, but they come in thin and scraggly. He has numerous children, all out of wedlock and all from different women. After the 2003 opening of the Chukchansi Gold Resort and Casino, the Chukchansi Tribe has developed a bad habit of disenrolling its own members. Hundreds of people have been ejected, denying them benefits, and thus giving the survivors a larger share of the pie. The tribe has ousted members of documented ancestry and several of the last native speakers of the Chukchansi language. Between 2003-2013, the tribal membership plummeted from around 1800 members to about 900 members. In T-America, some tribes still have serious membership problems. Different states have handled this in different ways. Some have designated an existing reservation to accept rejected individuals, so long as they can prove tribal ancestry from the U.S. government rolls. Even if they are no longer counted among their tribe of birth, the government is still liable for its obligations to them. Others have set aside a new reservation from government-owned land, in support of people who want to establish a new tribe from the fragments of several old ones. However, both of those solutions only apply to residents of that state and/or its tribes. There isn't really a national solution yet. Additionally, a few tribes have voted to take in people rejected by related tribes, but this has its own pros and cons. The government is also negotiating with some tribes to sever the dependent relationship, giving them back more of their treaty land but no longer providing payments, in the hope that they can become independent. This would at least get the U.S. government out of the argument over who is or is not "Indian enough." Watermark (Culaccino) (Vedette Fedele) -- She has light olive skin, brown eyes, and short straight brown hair with a wide stripe of bluish-breen. A blue-and-white tattoo of a wave wraps around the upper part of her left arm. She comes from the municipality of Cosoleto in the region of Calabria in Italy. Vedette is a soft butch lesbian, and prefers lovers of moderate to butch persuasion rather than femmes. Her personality is fluid, easily shaping itself to the current context around her. Skilled at reading people, she makes both friends and business contacts easily. Watermark works as a bodyguard for the Marionettes, particularly in cases where raw physical violence is not ideal. She uses aikido and de-escalation skills, along with subtle touches of her Water Powers, to keep people safe. If provoked, though, she is entirely capable of making limbs swell to immobility or of filling someone's lungs with water. Her nickname comes not from the colored hair but from her habit of leaving dangerous opponents with a permanent spiral scar by distorting the water within skin cells, so that she and others can recognize them easily in the future. Origin: When she was thirteen, she got swept away by a flood and presumed lost. She returned three days later with a broad aquamarine streak through her hair, and Water Powers. Uniform: On duty, she wears a masculine business suit. Off duty, she wears fashionable masculine clothing, usually from Italian designers. For swimming, she likes turquoise and white striped swim trunks with a bareskin top. Vulnerability: As a Water elemental, she takes double damage from Fire, whether superpowered or ordinary. "We English speakers have tried our best to describe this phenomenon with the phrase “water mark,” but Italians have had this term on lock for quite some time. Whispering the word culaccino makes us want to sit back, relax and sip an ice-cold drink on a hot, lazy day -- and then we remember that it’s fall, and we want to hop on a plane ASAP." Here is Watermark with some friends, and a closeup of her Bareskin top. The one on the far left is an Earth elemental tattooed with roses and ivy. Watermark is next, with her blue streak temporarily colored brown. The woman in the pink swimsuit is a transwoman with Fire Powers, and a flaming tattoo on her thigh. The one on the far right is a transman, an Air elemental tattooed with angel wings on his back and birds on his wrists. There are many types of stealth weapons. Watermark has last-ditch knives laced into her boots. A covert coin knife has a hilt and sheath made from two halves of a coin. Her keychain knife is a Mini Black Night Watchman. 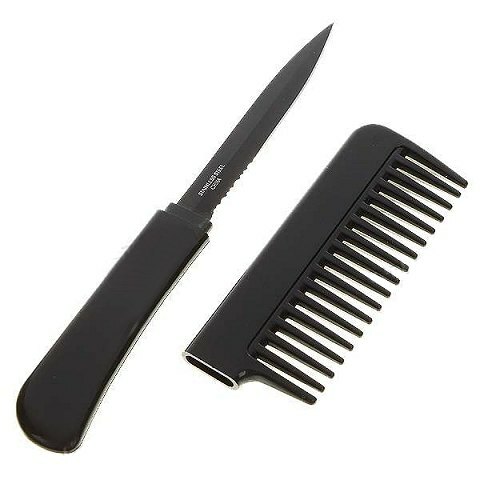 A comb knife is typically made of rigid plastic so it won't set off a metal detector. Her money clip also contains a hidden knife. This wicked little gem is a pressure point weapon. Hit someone in a sensitive place, and it increases the effect. Watermark is wearing it in the palmar position for slapping or grabbing, but it could also be worn on the back of the hand, the way some people use heavy rings as brass knuckles. Sandy Vierra -- She has naturally tan skin, brown eyes, and long curly brown hair. Her body is muscular with wide shoulders, flat chest, and narrow hips. Her heritage is predominantly Latina with some Chinese plus a little British and Italian. She speaks English, Mandarin, and Spanish. Athletic and boisterous, Sandy loves communal sports such as beach volleyball or cooperative obstacle courses. She also enjoys waterfront recreation such as beachcombing and exploring tidepools, and she volunteers to protect baby sea turtles from predators as they scramble toward the waves. On the weekends she likes to visit the Pacific Ocean; during the week she favors the Merced River. Her favorite reading is the trashy fiction characterized as "beach books." At home Sandy has landscaped her entire yard with plants, primarily native to the area, that require no supplemental watering except to establish new ones. Her house is a lovely little one-bedroom cottage with a studio loft which she has turned into a personal gym. One of her neighbors is a Yokut man who likes to make things from traditional materials. Sandy trades him things from her yard in exchange for him looking after her place when she gets called in to work suddenly or is injured. Sandy serves as a firefighter in Mercedes, California. Her courage and energy make her very popular with her teammates. She is interested in learning soup care, but hasn't had an opportunity yet. Sandy is not good at ladythings such as painting her face or walking in high heels. She thinks she's hawt enough in fireproof pants and a sport bra. She is right. Saltation (Digo Ingram) -- He has ruddy skin, brown eyes, and short curly brown hair. He wears a short beard that goes from ear to ear, wrapping under his jaw. He has some pretty radical scars from a beach accident, but the big ones are hidden under knee-length shorts and a t-shirt. Digo enjoys beachcombing, and often picks up litter as he goes. He also makes and plays percussion instruments from junk. Often he incorporates large pieces of beach garbage, such as hubcaps or PVC pipe; the chemical changes caused by water can create fascinating influences on the musical notes produced. Digo took a double major at the Scripps Institution of Oceanography, studying both the biology and geology of coastal environments with an eye toward environmental preservation. 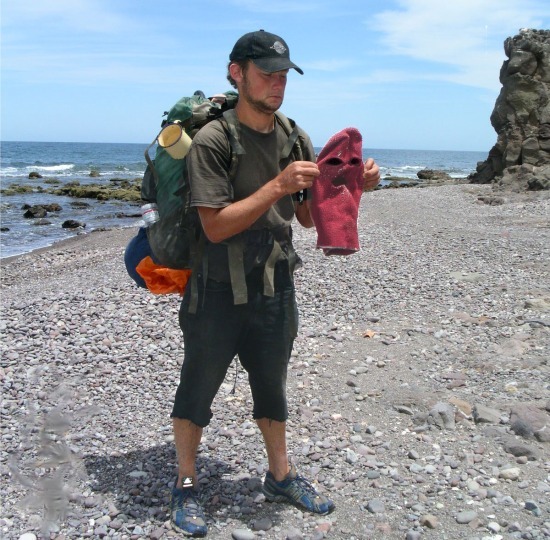 Currently he works for the California Coastal Sediment Management Workgroup, primarily replenishing beaches by moving sand from undesirable locations (such as harbors) to desirable locations (such as shrinking beaches). Sometimes he also helps with marine search-and-rescue; in the picture, he's holding a mask after recovering the body of a supervillain who drowned when he dove into the ocean to escape arrest. Christopher also does presentations on environmental awareness and the creative application of superpowers in professional work. Origin: During a college field trip, he was swept away by a rogue wave and battered against the rocks. While submerged, he struggled to regain control of himself and move purposefully through the water -- and his superpowers manifested. He spurted up onto a large outcropping of rock, where the Coast Guard managed to rescue him. His superpowers primarily influence Earth and Water, allowing him to influence local ocean currents and control the movement of sand. He can manipulate Air also, but only at Good (+2) level. Vulnerability: He takes double damage from fire. This has left him with a strong fear of it, not phobia level (since it is a reasonable fear) but enough to be bothersome at times. 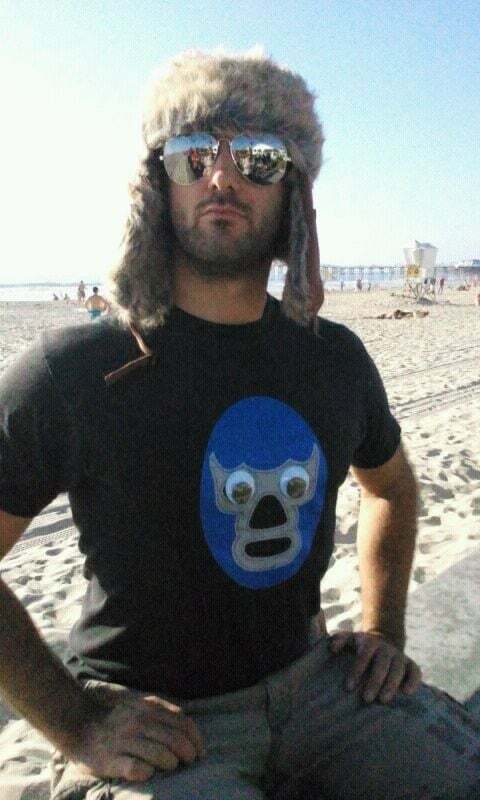 Motivation: To protect the beaches of California. Love the bits of etiquette in this story - Watermark's suit reminded me. Yeah, she is hawt. So is Danys, for that matter. Yay! :D She is a Marionette, and for all she's dressed down at the beach, that suit is more typical of her work wear. I like their butches. Most, like Watermark are masculine women and/or genderqueer. The transfolk who choose to transition tend to blend right in with the cisfolk. The Marionettes do have a higher proportion of QUILTBAG folks, because they're one of the few Families tolerant of that stuff, so people gravitate there. It gives them a larger share of talent that other people have overlooked, which boosts their power. Also, after you've rescued people and accepted them and put them back together after someone else dropped them on their heads, then they tend to be Very Loyal Indeed.